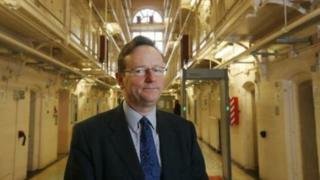 Scotland's chief inspector of prisons has called for an end to jail terms of less than 12 months. David Strang said the evidence was clear that such sentences did not cut crime and called for a "more creative approach" to community-based options. Since 2010 the Scottish courts have operated a presumption against prison sentences of three months or less. The Scottish government has yet to publish its response to a consultation on increasing that to 12 months. Speaking on the BBC Radio's Good Morning Scotland programme, Mr Strang, who was formerly the chief constable of Lothian and Borders Police, said sending more people to jail to serve shorter sentences would result in reconviction rates spiralling as well as an increase in offending. He said: "The evidence is very clear that if you want to reduce crime then you don't send people to prison for a short time. "People who are released from a short sentence of less than 12 months, over half of them are reconvicted within one year. "So I would have thought that one purpose of the criminal justice system is to prevent future crimes, to reduce reoffending, and that if you send someone to prison then the damage that that does leads to them reoffending more than if you had given them an alternative." Mr Strang called for a more creative approach to community-based alternatives to prison, including fines and payback orders, which he said were much cheaper and far more effective. He said that keeping a convict in prison for a year costs between £30,000-40,000 in Scotland, whereas a community payback order costs less than £10,000 a year. The Scottish courts have a presumption against imposing prison sentences of three months or less unless it can be shown that no other alternative is appropriate. Mr Strang said he understood that ministers were inclined to back plans to increase the period to 12 months. He added: "I think there is quite a punitive attitude in Scotland in that somehow people feel that unless someone is sent to prison then they haven't really been dealt with properly for their crime. "It's really important to get the message over that that's not the case. We should only be imprisoning people who need to be for the sake of either the seriousness of the offence that they've committed or particularly to protect the public from harm." Scottish Conservative justice spokesman Liam Kerr said: "Short-term prison sentences can play an important role in our justice system, and it would be ludicrous to end them. "We cannot fetter judges' discretion without full consideration of the consequences and wider policy context. "There are many offences and circumstances where a custodial sentence of up to 12 months could be an appropriate punishment, and we need to allow judges the choice to hand down such sentences if they deem it necessary." A Scottish government spokesman said the prison population remained "unacceptably high" and that it was setting out plans to invest in community sentences and electronic monitoring. He added: "We have consistently stated that the consultation responses on extending the presumption against short prison sentences would inform our decisions and it is only right that we take the time to consider these views. "We'll continue to discuss how best to take this forward with the relevant stakeholders. "There will, however, always be some crimes where a custodial sentence is absolutely justified."